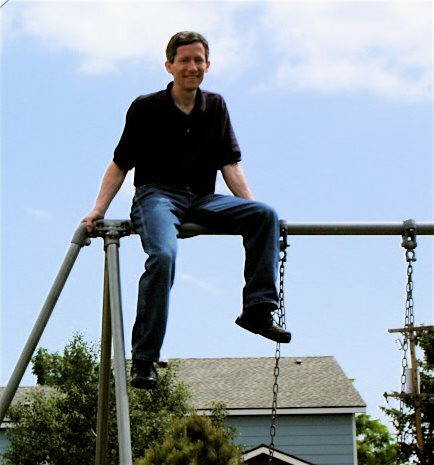 Bruce atop the swing set at Alpine Valley School in Colorado last MayBruce L. Smith has worked in education for more than twenty years and with Sudbury schools since 1997. He recently moved to Austin, where he writes about education, creativity, and mindfulness, serves on the staff of the Clearview Sudbury School, and steers a nonprofit organization that he cofounded, the Center for the Advancement of Sudbury Education (CASE). Bruce kindly adapted this guest post for Alt•Ed Austin from a recent piece on his own blog, Write Learning. For the past fifteen years, I’ve been promoting a model of alternative education that’s about as individualized and child-centered as they come. In a nutshell, places like Austin’s Clearview Sudbury School feature self-directed learning in mixed-age, democratic communities. Don’t ask yourself what the world needs. Ask what makes you come alive and then go do that. Because what the world needs is people who have come alive. Sometimes I describe the Sudbury model as “agenda-free learning.” This approach not only steers clear of such conventional elements as compulsory academics, rigid schedules, and adult control; we also refrain from nudging students in any particular direction, however progressive or worthy. And this leads to some very lovely results indeed. In Thurman’s words, students at schools like Clearview “come alive” in myriad ways. Empowered and trusted to decide for themselves what’s worth their time and effort, these young people shine. Their passions emerge and their talents thrive even as they tackle their weaknesses. Life for these students is a matter of authentic work and rewarding play. In other words, Clearview Sudbury gives young people a school of their own, a place where they learn from everyday life in a community of equals. Clearview students direct the course of their days and help manage the school’s business, from drafting and enforcing rules to making budgetary and personnel decisions. Through open-ended play, exploration, conversation, and meetings, our students learn how to find their way in the world; how to obtain the help they need; how to realize their goals while respecting the rights of others; and how to coexist with people of various opinions and personalities. To the extent that Sudbury schools have an agenda, I’d say it’s one of self-actualization within community, balancing freedom and responsibility. It could be argued that one doesn’t need a school to learn such things—or even that school interferes with this sort of learning, placing an unnecessary layer between the student and the outside world. While I respect this view, in my years with Sudbury schools I’ve found that there is one thing they offer students that they’re unlikely to find elsewhere: a place to freely practice authentic, responsible, effective living. How common is it for children and young adults to learn in settings where they’re treated as equals—where they are, in a real sense, peers with people of all ages? How often do we allow young people to make substantive, meaningful decisions and then live with the consequences? How free are they elsewhere to experiment with different ways of being in the world, practicing the independence they’ll know as adults while growing up in a safe, respectful community? After even a short time, Sudbury students begin exhibiting superlative self-awareness, integrity, and interpersonal aptitude. Given freedom—and expected to handle it responsibly—hundreds of students at dozens of schools have become more playful and mature, more articulate and thoughtful, more enthusiastic and determined. Schools like Clearview Sudbury show what we get when we set our expectations this high: strong, lively individuals and capable community members in love with life. Once I was asked by a graduate’s parent what I thought she’d gained from going to the school where we’d known each other. After a moment I replied, “a head start on her adult life.” She knew more about herself and how to pursue her dreams at age eighteen than many do well into their twenties or thirties. She had much less to unlearn and overcome than people whose education was directed by others. In the end, agenda-free learning is far more empowering than any external curriculum. All the qualities that foster success in the twenty-first century—things like initiative, persistence, adaptability, resourcefulness, and responsibility—are nurtured to an amazing degree at Clearview Sudbury School, where students have a place of their own to come into their own. And as Thurman says, this is what the world needs.